A crusading journalist is running to take down one of Albany’s sleaziest pols as NY progressives take aim at GOP-controlled state Senate. You might think that New York State, with its overwhelmingly liberal populace, would provide a blueprint for barricades or at least buffers lawmakers might erect against the far-right agenda now frothing out of Washington. But no. 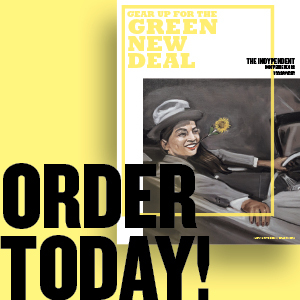 Universal health care, stronger rent regulations and tenant protections, cuts to greenhouse gas emissions, a genuine medical marijuana program, early voting, campaign finance reform, and tuition assistance for undocumented college students are just some of the progressive reforms that have gone to the state Senate to die. But look out, Albany. An emerging cadre of Democratic candidates plan on busting up the delicate balance of power in Albany in 2018 and blue-ifying New York — for real. Among them is Ross Barkan, a journalist by trade, who in October announced his candidacy in the 22nd Senate district in southern Brooklyn. Tired of beating Albany over the head with his pen, first for the Observer — until the Jared Kushner-owned rag endorsed Donald Trump for President — and later for the Village Voice and Gothamist, the 28-year-old opted to step into the political arena himself. Will GOP control of the NY Senate end in 2018? On a rainy December night in Long Island City at John Brown’s Smokehouse, as a fundraiser for Barkan wound down in a tent behind the brisket joint, he explained what first motivated him to run for office. It was over the summer, when New York City’s subway crisis began to reach its apex and Gov. Cuomo wondered out loud “who’s in charge.” (He is.) 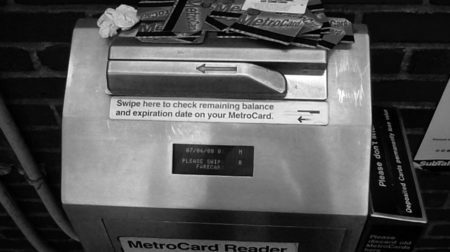 As is the case in much of the city, the trains in Barkan’s native Bay Ridge neighborhood run infrequently, and none of the stations in District 22 are compliant with the Americans with Disabilities Act. He wants the Metropolitan Transportation Authority’s (MTA’s) budget boosted, and for the agency to spend money on computerizing its Depression-vintage signaling system rather than on flashy beautification projects backed by the governor. Those relationships with conservatives might come in handy if Barkan’s reform politics are to at least receive an airing in District 22, an artfully gerrymandered bastion of mostly ethnic-white and Republican voters that looks something like a cubist interpretation of a trowel imposed diagonally over Brooklyn’s south end. The fat northwestern handle of the district takes up Bay Ridge, Dyker Heights, Fort Hamilton and a chunk of Bensonhurst, avoiding the public-housing projects of Bensonhurst andConey Island. Conveniently slim in the middle — save for a northwestern detour at Ocean Parkway — it bloats out again in a V shape, shoveling up the Gerritsen Beach and Manhattan Beach neighborhoods to its south and Marine Park to the north, much to the benefit of Barkan’s opponent, Republican incumbent Martin Golden. New York State voters are predominantly blue but, in part due to gerrymandering, the state legislature is a bruised purple. For decades, the Democrats in control of the Assembly have outlined districts to their advantage, and by mutual agreement have allowed the Republicans in control of the Senate to do the same. Backroom deals, lax campaign-finance laws, lulus — stipends that come with committee chairmanships — and, of course, pork are other ingredients in how the sausage is made in the state’s capital. For a muckraker aiming to take on the muck, Barkan could not have chosen an opponent more drenched in mire. Golden has funneled hundreds of thousands of dollars in campaign funds from landlord and law enforcement lobbies into his family catering business since he was first elected in 2002. His office did not respond to requests for comment on this article. Marty Golden (pictured at right) has repeatedly raised the eyebrows of government watchdogs for funneling campaign funds to Bay Ridge Manor, a catering business owned by his brother, where his wife works as an administrator. Golden was its proprietor until 2002, when he sold the company to his brother after he was first elected to the state Senate. He remains the owner of the building where it’s located and continues to receive rent on the property. A large portion of Golden’s campaign money has come from the real-estate industry ($284,424), as well as construction unions ($160,150) and contractors ($68,425), according to the nonpartisan National Institute on Money in State Politics, which collects campaign contribution data. Landlords and their lobbying groups, such as the Neighborhood Preservation PAC and the Rent Stabilization Association — an organization that advocates for weakening and eventually eliminating rent-stabilization tenants — have put over $100,000 toward Golden. With many of his constituents owning single-family homes, developers and landlords see the senator as someone who can oppose tenant-friendly legislation without fearing voter reprisals. Lobbying shops and unions that represent police and corrections officers, however, are by far Golden’s largest givers. They’ve showered his campaigns with $387,000 over the years. Barkan said he hopes to raise “several hundred thousand dollars” through small contributions. Last summer’s City Council bid by Palestinian-American pastor Khader El-Yateem in Bay Ridge serves as an inspiration for Barkan. El-Yateem raised over $100,000 before he narrowly lost the September Democratic primary. Though he resists being pigeonholed with the Berniecrat label, Barkan is seeking endorsements from the Working Families Party and the Democratic Socialists of America, which sent many of its 2,000-plus New York City members out knocking on doors for El-Yateem. 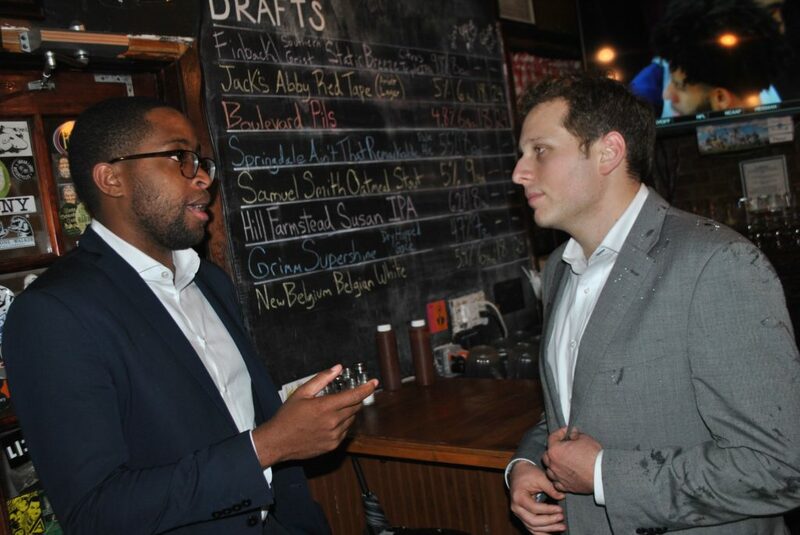 INSURGENTS: Fellow Senate candidate Zellnor Myrie confers with Barkan during a joint fundraiser in Queens. Credit: Peter Rugh. Barkan says he is already excited by the “number of people, the wide array of people, from all backgrounds” who have given to his campaign. Like El-Yateem, he wants to connect with the changing face of southern Brooklyn — home to a growing Arab population that enthusiastically supported Bernie Sanders in the 2016 presidential primaries — but to also be a candidate the district’s older white voters can get behind, by addressing bread-and-butter policy concerns. Barkan sees his campaign as paralleling the primary challenges to the members of the Independent Democratic Conference (IDC) — the breakaway Democrats who share power with the Republicans. Technically speaking, Democrats hold 32 seats in the Senate to the Republicans’ 31, but the GOP wields power thanks to the IDC, along with Sen. Simcha Felder of Borough Park, a Democrat who caucuses with the Republicans. “They’re turncoat Democrats, Trump Democrats,” said former City Councilmember Robert Jackson, who led a decade-long battle for fair state funding for urban school districts before entering electoral politics. He is challenging the IDC’s Marisol Alcantara for her Upper Manhattan seat. Attorney Zellnor Myrie is looking to knock off IDC member Jesse Hamilton of Prospect-Lefferts Gardens, and Jessica Ramos, a former labor union staffer turned aide to Mayor Bill de Blasio, is mulling a run against Jose Peralta in Jackson Heights. Their candidacies come amid a year-long grassroots push by activists with the Working Families Party, Fordham School of Law professor Zephyr Teachout — who won more than one-third of the vote in her longshot challenge to Gov. Cuomo in the 2014 Democratic primary — and others who have held rallies in Albany and bird-dogged the Republican collaborators in order to shine light on and break up the alliance. Treachery has its perks, however. Senate Republicans have been generous to the IDC turncoats. IDC members receive additional staff, computers and larger offices, and committee chairmanships that attract donors hoping to influence legislation and come with lulus ranging from $9,000 to $34,000 a year. 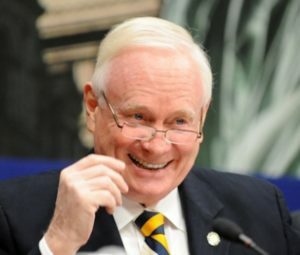 As lawmakers often chair multiple committees but can legally receive only one stipend, Republicans opt to receive lulus from the committee with the largest payout, and then pass the cash remaining on the table to GOP and IDC vice chairs, misleadingly listing them as committee leaders on payroll documents submitted to the state comptroller. Jesse Hamilton, for instance, chairs the Banks Committee, receiving a $15,000 stipend. The IDC’s political chicanery has also meant that Senate Democrats have secured just $3 million for their districts out of the $1.6 billion State and Municipal Facilities (SMF) bond issuance program established in 2013, while the Republicans have received $210 million and IDC members $35 million. The largest IDC share has gone to the faction’s leader, Jeff Klein, who took $17 million in SMF bonds home to his northeast-Bronx/Westchester district, where a 2018 primary challenger has yet to emerge. Klein has used the dough to put millions of dollars toward park upgrades in his district, according to records from the state Dormitory Authority, which reviews most SMF requests. With each party ruling a legislative house, the spoils are nearly divided: Assembly Democrats have steered $150 million in SMF earmarks their way, with Republicans getting just $4 million. But beyond the pork, the power split allows the Assembly and Gov. Cuomo to support liberal legislation, but blame the Senate when the bills are watered down, as happened with 2016’s $15-an-hour minimum-wage law. If a measure goes nowhere, like 2017’s universal health care bill, Cuomo and company can also blame the Senate. In neither scenario do they lose face before their well-heeled donors. It remains to be seen where the state’s powerful labor unions will fall in 2018. In the past they have campaigned for and donated heavily to Cuomo and the IDC senators. With the Trump administration powerfully anti-labor and a pending Supreme Court decision that could force public-employee unions to represent nonmembers for free by banning “fair-share fees,” unions could be more likely to back less progressive candidates they are confident will win, in order to have a seat at the table when legislation is drafted or when their contracts are up. Myrie, Robert Jackson and their comrades have apparently lit a fire under Albany. Cuomo brokered an agreement that is supposed to bring the IDC members back into the mainline Democratic caucus, which has 23 members and is headed by Andrea Stewart-Cousins of Yonkers, who is poised to become the first woman of color to lead either house of the legislature. The IDC says it’s on board, with Jeff Klein praising the offer as an “assurance that our progressive legislative agenda will be advanced.” But Cuomo will likely blunt the deal’s effect by not calling a special election to fill two vacant seats in Democratic districts until April, after the March 31 budget deadline — the most important day on the legislative calendar. Even if the IDC steps on board, Simcha Felder will likely be a holdout. Secure in his Borough Park seat — home to a conservative, predominantly Orthodox Jewish community — he promptly went over to the Republicans after being elected as a Democrat in 2012. Felder has urged IDC senators to rejoin the Democratic fold but has made excuse after excuse for not doing so himself, telling one reporter he won’t join up with his party again until there is an armed guard stationed at every New York City school. One Republican will have to fall if Democrats hope to win control of the Senate again. Barkan hopes it will be Marty Golden. In Washington State, an IDC-style agreement in which two Democratic state senators made a power-sharing deal with Republicans ended after last November’s elections when voters gave Democrats full control of both houses of the legislature and the governorship. The odds of knocking off all nine of the New York Senate’s renegade Democrats in one election are much steeper. But the days when IDC members could brazenly live a double life in Albany without being noticed by their constituents are over. 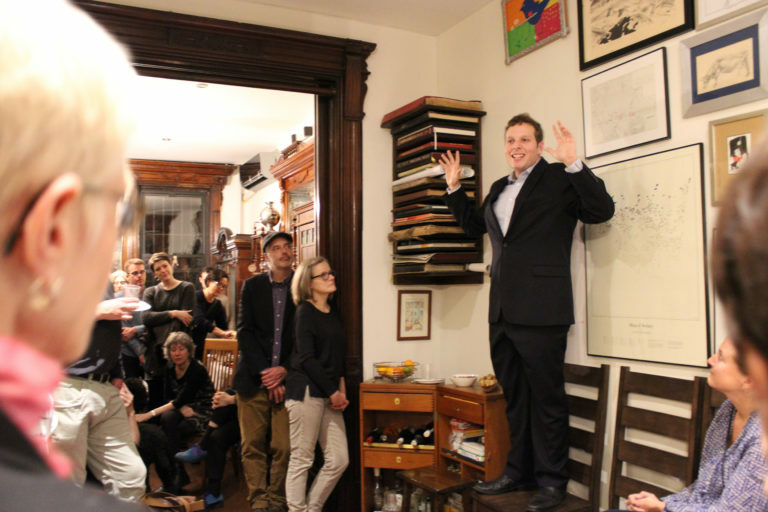 Photo (top): STUMP SPEECH: State senate candidate Ross Barkan speaks to supporters at a house party hosted by the writer Masha Gessen. Credit: Vanessa Ogle. The MTA’s Next Big Boondoggle? A $574 million contract was awarded to the company that botched Chicago’s digital fare rollout.